For a number of years, “civil society” has become a buzzword in Pakistan. When in 2007 Pakistani lawyers started to protest against the dismissal of Chief Justice Iftikhar Mohammad Chaudhry, the lawyers’ movement was largely equated with “civil society”. Sometimes, civil society in Pakistan is even credited with having toppled the military government of Pervez Musharraf. Beside the lawyers, there are many other actors that claim the concept while other Pakistanis regard “civil society” with high suspicion, invoking ideas of foreing driven agendas that are seen as just another instrument of the West to dominate Pakistan. “Civil society” is an old and venerated concept of Western political thought. It is mostly imagined as a public space between state, market, and the private realm of the family. A number of writers like Partha Chatterjee and Akhil Gupta have questioned the global applicability of the concept, given that state and family may be imagined and practiced very differently in non-western societies. The goal of research in Islamabad was to explore the meaning of the concept of civil society in Pakistani “civil society organisations”. Our question was not whether the application of the concept in Pakistani society makes sense or not. Given that “civil society” has become a household term in Pakistani English language discourse we took it for granted as an “emic concept”. The student members of the research group worked for six weeks in February and March 2010 with different civil society/non-governmental organisations (among them Sungi Development Foundation, Centre for Civic Education, Ethnomedia & Development, Funkor Child Art Center and Pattan Development Organization) or social activists in Islamabad in order to find out how the concept of civil society is used and understood, particularly in relation with ideas and images of “the state”. Beside fieldwork Islamabad, we also visited Lahore where we met with social activists of the Heinrich-Böll-Foundation. In addition to the research project, we took part in an exchange programme with Prof. Azam Chaudhary and his students at the National Institute of Pakistan Studies, Quaid-I-Azam University. Besides meetings and discussions in the classroom we jointly undertook excursions like visits to archaeological sites around Taxila and Muslim shrines in Islamabad. Currently, we are in the process of analysing the field data. We hope to present a report on our findings here soon. 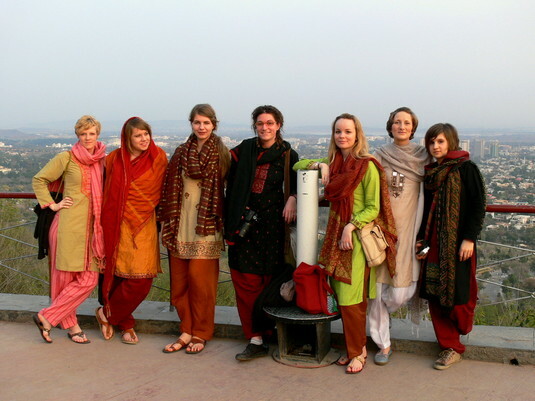 The student members of the group are: Lena Barbi, Amy Croome, Veronika Koch, Clarissa Leopold, Birgit Riegler, Johanna Schiller and Jacqueline Wilk. We are very grateful to the German Academic Exchange Service (DAAD) and the Institute of Social and Cultural Anthropology, LMU, for generously contributing to funding the project. The project took place within a framework of academic cooperation of the National Institute of Pakistan Studies, QAU, and the Institute of Social and Cultural Anthropology, LMU. We would like to thank the National Institute of Pakistan Studies and particularly Prof. Dr. Azam Chaudhary for their support and hospitality. Have a look at our web gallery. Chatterjee, Partha (1990). A Response to Taylor's "Modes of Civil Society". Public Culture 3: 119-132. Chatterjee, Partha (2001). On Civil and Political Society in Post-Colonial Democracies. In: Kaviraj, Sudpita; Sunil Khilnani (eds. ): Civil Society: History and Possibilities. Delhi, Cambridge University Press: 165-178. Gupta, Akhil (1995). Blurred Boundaries: The Discourse of Corruption, the Culture of Politics, and the Imagined State. American Ethnologist 22: 375-402. Pasha, Mustapha Kamal (2001). Savage Capitalism ad Civil Society in Pakistan. In: Weiss, Anita M.; S. Zulfiqar Gilani (Eds. ): Power and Civil Society in Pakistan. Karachi, OUP: 18-45. Shah, Aqil (2004). Pakistan: Civil Society in the Service of an Authoritarian State. In: Alagappa, Muthiah (ed. ): Civil Society and Political Change in Asia. Stanford, Stanford University Press: 357-388.